You’re part coach, part gatekeeper. You protect your team and help them solve tough problems. You could give Ken Schwaber a run for his money. But how can you prove all that on an 8x11 sheet? It’s actually not hard. Follow the best practices, and soon you’ll be planning sprints like Mike Cohn. A Scrum Master resume sample better than 9 out of 10 others. How to write a Scrum Master resume that gets more interviews. Tips and examples of how to put skills and achievements on an Agile Scrum resume. How to describe your experience on a resume for a Scrum Master to get any job you want. 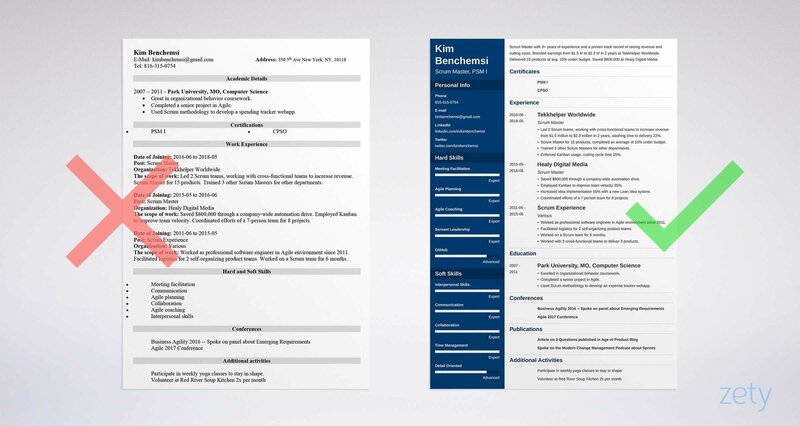 Here’s a scrum master resume sample made with our resume builder. What's the Best Format for Scrum Master Resumes? Meet Pete, the Scrum Master hiring manager. He’s got a coffee mug that says, “Scrum and get me” and 300 Scrum Master resumes to read by end of day. Your resume for Scrum Master jobs needs to strut your stuff at a full sprint. Because it shows your latest, greatest wins first. Keep the layout as simple as a burn down chart. 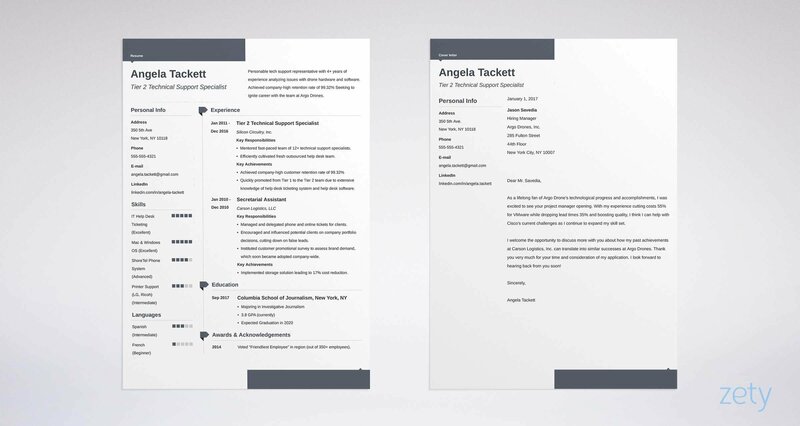 Mix white space, punchy headings, and the professional resume fonts to make your info easy on the eyes. Finally, save that certified Scrum Master resume as a PDF. Resumes in word DOC format can backfire in transit. Just make sure the job offer doesn’t nix them. Pro Tip: Switching into scrum from some other career? In that case, try the combination resume format. It collects your greatest career hits from all over. The right Scrum resume can make the hiring manager say the words above. Most resumes only get six seconds of reading time. How can you convince anyone to hire you that fast??? But you can persuade them to read your resume. Do that with a Scrum Master resume summary or resume objective. Which is which? And which is right for you? A resume objective is for fledgeling Scrum Masters. Use it to show your Martin-Fowler-level passion. A resume summary shows experience. Use it if your achievements have achievements. Let’s start with two senior Scrum resume examples. Try to spot the impediment to success in the first of our senior Scrum Master resume samples. Hard-working Scrum Master with 3 years of experience. Responsible for all Scrum Master tasks at Tekkhelper Worldwide, including gathering requirements, leading scrum teams, and delivering products. That’s not as bad as ignoring the customer’s needs, but it won’t win any trophies. Certified Scrum Master with 3+ years of experience and a proven track record of raising revenue and cutting costs. Boosted earnings from $1.5 M to $2.3 M in 2 years at Tekkhelper Worldwide. Delivered 15 products at avg. 10% under budget. Saved $800,000 at Healy Digital Media. Bam. Straight outta The Five Dysfunctions of a Team. You’re not sunk yet. Look at these two entry-level Scrum Master resume samples. If your Scrum Master experience is a little too lean, use a resume objective. Passionate entry-level Scrum Master, skilled in meeting facilitation and Agile planning. 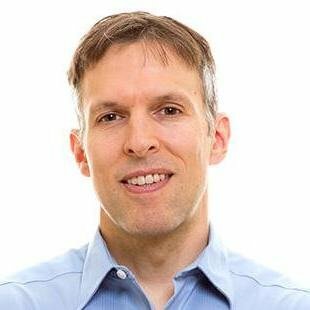 Expert in Agile coaching and servant leadership. Eager to learn on the job. Three cheers for passion! Now let’s hire someone with experience, right? Enthusiastic entry-level Scrum Master. Have worked in Agile environment as a software engineer for 7 years. Worked on two Scrum teams and filled in as Scrum Master on several occasions. Proven history of successful work with cross-functional teams. You just burned it down. But where can you get even that much experience? Pro Tip: Put one or two skills in your Agile scrum master resume summary, but no more. Make sure they’re listed in the job ad and prove them later with achievements. Remember Pete, our hiring manager? He’s got two blockers when it comes to hiring. The first is resumes with waterfalls of irrelevant experience. The second is applicants with no experience at all. I’ll show you how to fix both. First, if your experience would put Jurgen Appelo to shame, don’t show it all. That’s not Lean! Instead, show the tip of the iceberg. List your most recent job first. Add 3-5 bullet points crammed with measurable achievements. The next of our Agile resume examples shows how. Led 2 Scrum teams, working with cross-functional teams to increase revenue from $1.5 million to $2.3 million in 2 years, slashing time to delivery 22%. Scrum Master for 15 products, completed an average of 10% under budget. Trained 3 Scrum Masters for other departments. Enforced Kanban usage, cutting cycle time 25%. The hiring manager who’d ignore that probably thinks “Scrum” is some new bathroom cleaner. Worked in position as Scrum Master for Tekkhelper Worldwide. Handled multiple products in the course of two years. In charge of various trainings. Responsible for enforcing Kanban usage across the company. Look familiar? That’s the Agile resume version of optional deliverables. Now, what if you’ve got no experience as a Scrum Master? Our next entry-level Scrum Master resume samples show what to do. Let’s say you’ve never been a Scrum Master, but you want to be. Stuff your Scrum resume with relevant experience. Been on a scrum team? Demonstrated skills as a communicator or collaborator? None of those are “scrum master experience.” Yet they’re 100x better than listing “no experience” (or irrelevant experience). They make a Scrum resume with no experience look like Craig Larman wrote it. The next two entry-level Scrum Master resume samples show how. Why does one of these fresher Scrum Master sample resumes fly, while the other splats? Scrum Master Experience: Still looking for my first official Scrum Master job. I’m very passionate and eager to start! Ick, someone get the paper towels. That’s like a cancelled sprint. Worked as professional software engineer in Agile environment since 2011. Worked on a Scrum team for 6 months. Worked with 3 cross-functional teams to deliver 3 products. That’s as good as doing twice the work in half the time. Yet none of it is Scrum Master experience. It all came from other jobs. Pro Tip: A Scrum certification can increment you toward getting hired. I’ll share how to show certifications on a resume for Scrum Masters soon. There’s no bachelor’s degree in Scrum mastery. So why care about your education section? The same reason you’d never have a silent standup. It’s there, so use it. Done right, it can be the thing that gets you hired. The certified Scrum Master resume samples below show right from wrong. Excelled in organizational behavior coursework. Completed a senior project in Agile. Used Scrum methodology to develop an expense tracker webapp. That candidate has done more than read the Scrum Guide. She’s been in training since day one. You might as well write “education here” on your Agile Scrum Master resume. Pro Tip: Does GPA belong in a resume for Scrum Masters? If it’s impressive or recent, add it. If not, save the space for a real achievement. Let’s pretend we’re in an elevator with Pete, the hiring manager. We ask him what one thing is most important for a Scrum Master. So, Google “Scrum master resume skills” and copy-paste the list. Right? See, Pete has a very specific list of skills in mind. Luckily, he put them in the job ad. Only one of the professional Scrum Master sample resumes below makes him happy. Scrum Master Skills: Automation, Kanban, and Idea Systems. TL;DR, right? Anyone can say that. Why not prove it? Saved $800,000 through a company-wide automation drive. Employed Kanban to improve team velocity 35%. Increased idea implementation 55% with a new Lean idea system. Coordinated efforts of a 7-person team for 8 projects. With a resume for Scrum Master jobs like that, you’ll be holding Daily Scrums in no time flat. Use the Scrum Master skills for resumes below. Need some Scrum Master resume skills to start out? Use this list. The skills on it make great resume keywords for Scrum Master jobs. Follow those steps, and your Agile resume will put you in the Salesforce zone. Pro Tip: Also show relevant software knowledge on a Scrum Master resume, like GitHub, Trello, or JIRA. Bonus points if they are listed in the job description. Do you need a certification? Does it help? Especially on entry-level Scrum Master resumes, a certification makes a great springboard. The PSM 1 cert carries weight and costs $150. If you think you’ve got the skills, you can even waive the 2-day class. Got more experience? PSM II and III provide more oomph. CSM is another well-respected cert. Add it to your resume header. But don’t stop there. That way, no matter where the hiring manager glances first, he knows you’re certified. You can add other certifications on a resume for Scrum Master jobs. The key rule? Make sure they’re relevant to the opening. Pro Tip: Do you need a PSM certification? Not if you’ve got experience. Experience beats certifications on any Scrum or Agile project manager resume. Once you’ve got experience, education, and skills, you’re done, right? Hiring managers really want to know if you will make a great employee. Another indicator is your passion. That’s why every Agile development resume needs other sections. They show you do more than the required minimum. See that work in two sample Scrum Master resume sections. It takes all kinds, right? But how does that make you a better Scrum Master? That applicant clearly lives and breathes Scrum and Lean. Even the CrossFit and volunteer work help because they show a well-rounded character. The real mind-blower? You probably have plenty of gold nuggets like that in your past. Just take the time to dig them up and dust them off. Pro Tip: If you’re writing an agile coach resume but you’ve never coached, look for relevant experience in your past. Maybe you’ve coached or trained others in non-Scrum roles. What About a Scrum Master Cover Letter? If you mean “big and powerful,” yes. Hiring managers often cite great cover letters as a reason for hiring. The good news? It’s not that hard to make a great deliverable. Use the hiring manager’s name to make it personal. Then, show you’ll meet the needs shown in the job description. This short example Scrum Master cover letter does it right. I’ve wanted to work at Moderal Global for years. I know you’re trying to cut costs and improve quality. At Tekkhelper Worldwide, my teams cut cycle time by 25% and product budgets by 10%. At the same time, we raised revenue from $1.5 M to $2.3 M in 18 months. End your cover letter with an offer like, "I’d love to discuss ideas to raise your revenue by 30% this year." Pro Tip: How long should you wait to follow up on your Scrum Master cover letter and resume? Most hiring managers say between one and two weeks. Of course you know to add contact info to your Scrum Master resume. But did you know how important a LinkedIn address is? These days, 87% of recruiters use LinkedIn while hiring. Also, if you’ve got a portfolio website, add it to your professional Scrum Master resume. Pro Tip: Your LinkedIn profile is as important as a Sprint Review. Use our guide to create a great LinkedIn profile. Use a resume summary or resume objective. It’s your TL;DR at the top of your Scrum Master resume. Pay attention to the job description. Use achievements to custom-fit your resume to it. Add other sections that show passion. An Agile Scrum resume with conventions, publications, or awards work beats one without. Write a cover letter. A resume without a Scrum Master cover letter is like speaking at a standup without being committed. Do you have questions on how to write a great resume for a Scrum Master? Not sure how to describe your skills or achievements? Give us a shout in the comments! Let's get you in that dream job.